The seemingly invisible cell is a magnificent, microscopic world all its own. It quietly goes about its business, carrying out each of its various functions in utter silence. Yet it lives its life in service to the creation and maintenance of a larger, superior organism. Cells, it probably will not surprise you to learn, come in a variety of sizes and shapes, and have different functions and life expectancies. For example, some cells (like male spermatozoa) are so small that 20,000 would fit inside a capital “O” from a standard typewriter, each being only 0.05 mm long. Some cells, placed end to end, would make only one inch if 6,000 were assembled together in a straight line. Yet all the cells of the human body, if set end to end, would encircle the Earth over 200 times. Even the largest cell of the human body, the female ovum, is unbelievably small, being only 0.01 of an inch in diameter. Some cells (like platelets in the blood) live a mere four days, while others (like brain cells) can live 100+ years. Certain cells (like the reproductive cells) have a single purpose, while others (like blood cells) serve multiple functions. Haeckel’s theory turned out to be little more than wishful thinking on his part, because as scientists began to unravel the secrets stored within the cell, and the fascinating biochemical code that it contained, they learned that within its infinitesimal boundaries, there lies a microcosm of activity that not only boggles the mind, but also exhibits spectacular complexity and intricate design. As Lane Lester and James Hefley put it in their book, Human Cloning: “We once thought that the cell, the basic unit of life, was a simple bag of protoplasm. Then we learned that each cell in any life form is a teeming micro-universe of compartments, structures, and chemical agents…” (1998, pp. 30-31). The “micro-universe” that we refer to as a cell can be described in a variety of ways. In Genes, Categories, and Species (2001, p. 36), Jody Hey described cells in a broad sense as “well-bounded entities”—i.e., masses of life contained within biological bubbles (i.e., plasma membranes) that selectively protect their contents from the harsh nonliving elements surrounding them. Franklin M. Harold, in The Way of the Cell, described cells in this manner: “We may think of a cell as an intricate and sophisticated chemical factory. Matter, energy, and information enter the cell from the environment, while waste products and heat are discharged…” (2001, p. 35). Thus, according to these two descriptions, the individual cell would appear to have many of the same features as an entire organism. In fact, the cell does possess many of the features of a whole organism. As it turns out, the cell is a veritable bastion of unimaginable complexity and design, in which the individual components collaborate to give the cell function and purpose of such intricacy that evolutionary theory is at a complete loss to explain it. As proof of that, I would like to offer the following. Most organisms are composed of multiples of cells. A human body, for example, is composed of over 250 different kinds of cells (red blood cells, white blood cells, muscle cells, fat cells, nerve cells, etc.—Baldi, 2001, p. 147), totaling approximately 100 trillion cells in an average adult (Fukuyama, 2002, p. 58). Yet each of those cells, in a similar fashion, is composed of a variety of microscopic units known as “organelles.” The cell is indeed the sum of its parts. And those individual parts, on their own, exhibit creative complexity and demonstrable design. Consider, as just a sampling of the organelles found within a normal cell, the following. It is amazing to learn that even what some would call “simple” cells (e.g., bacteria) have extremely large and complex “libraries” of genetic information stored within them. For example, the bacterium Escherichia coli, which is by no means the “simplest” cell known, is a tiny rod only a thousandth of a millimeter across and about twice as long, yet “it is an indication of the sheer complexity of E. coli that its Library runs to a thousand page-equivalent” (Cairns-Smith, p. 11). Biochemist Michael Behe has suggested that the amount of DNA in a cell “varies roughly with the complexity of the organism” (1998, p. 185). There are notable exceptions, however. Humans, for example, have about 100 times more of the genetic-code-bearing molecule (DNA) than bacteria, yet salamanders, which are amphibians, have 20 times more DNA than humans (see Hitching, 1982, p. 75). Humans have roughly 30 times more DNA than some insects, yet less than half that of certain other insects (see Spetner, 1997, p. 28). You will notice that such things as diagnosing, repairing, and reproducing are all functions normally associated with entire organisms. Yet DNA, as small as it is, performs these functions every day on the molecular level. The genetic code is a veritable masterpiece of design. An investigation into the structure and function of the DNA molecule shows that the prospect of DNA originating via natural processes is simply unreasonable. One of the functions of DNA is the production and maintenance of proteins. To accomplish this, the DNA requires the assistance of special organelles known as ribosomes. In order to prepare the DNA to be received by the ribosomes, specialized enzymes (RNA polymerases and certain proteins) break apart the DNA, and form a modified version of the DNA message, known as messenger RNA (mRNA). The mRNA then can be sent to the ribosomes for protein formation. For our purposes, we will think of ribosomes as fax machines, and the mRNA will be the paper that is fed through the machine. The ribosomes then will bind with another type of RNA known as transfer RNA (tRNA), based on the sequence of mRNAs that are being fed through the ribosome. Attached to these tRNAs are amino acids—the basic building blocks of proteins. In order to amalgamate the amino acids and form a polymer, each individual tRNA must bind with a specific site on the ribosome, and the amino acid must detach from the tRNA and bind with other amino acids on the ribosome to form a long chain. The ribosomes’ task is a lengthy, complicated process, and yet, fortunately, they make few mistakes, because such mistakes can result in a deformed, useless mass. Without the meticulous workings of the ribosome, structures such as hair and nails would not develop. Also, no proteins could be manufactured for the cell or the rest of the body. The mind-boggling complexity exhibited by DNA, ribosomes, proteins, and their molecular counterparts defy explanation via time, chance, and naturally occurring processes. Whence does the cell draw its power to drive the work of the ribosomes, as well as the myriad of other functions it is required to perform? The answer lies in the mitochondrion—the energy-producing organelles within the cell. Mitochondria are elongated structures with a smooth outer covering. Within the organelle, there are numerous convoluted folds, called cristae, which increase the internal surface area. This surface area is extremely important, because it provides a larger base for the mitochondria to use in the production of adenosine triphosphate (ATP)—the primary energy source for the cell (see “Mitochondria,” 2003). How does evolutionary theory explain this incredible interdependency of the cell’s organelles? How did they “learn” to cooperate? These questions can never be answered by simply suggesting small changes over time. A living cell is a self-reproducing system of molecules held inside a container. The container is the plasma membrane- a fatty film so thin and transparent that it cannot be seen directly in the light microscope. It is simple in construction, being based on a sheet of lipid molecules… Although it serves as a barrier to present the contents of the cell from escaping and mixing with the surrounding medium… the plasma membrane does much more than that. Nutrients have to pass inward across it if the cell is to survive and grow, and waste products have to pass outward. Thus, the membrane is penetrated by highly selective channels and pumps, formed from protein molecules that allow specific substances to be imported while others are exported. Still other protein molecules in the membrane act as sensors to enable the cell to respond to changes in its environment (1998, p. 347). Which came first? A first cell could not form without the specialized membrane holding it together and maintaining livable conditions inside, or the membrane that is only produced by a living cell? Remember, neither the lipids of cell membranes nor the proteins that make up their pumps and channels will form in nature apart from living cells (2002, p. 47). How could such a complicated covering as the plasma membrane come into existence via purely naturalistic forces? Amidst all of this production, waste is continually produced. The cell’s lysosomes are the means by which this waste is processed and expelled. Specific enzymes are carefully retained within the membrane of the lysosomes, which can digest practically any waste product. Interestingly, the lysosomes serve a dual purpose by also ingesting the food that is taken in by the cell. When a cell needs to digest nutrients, the lysosome’s membrane will fuse with the membrane of a food vacuole. The lysosome then can insert enzymes into the food vacuole in order to break it down. As a result, the digested food diffuses through the vacuole membrane and enters the cell to be used for energy or growth (“Lysosomes,” 2001). In the late 1982, the biologist Bob Horvitz made a bold suggestion: cells die as a natural result of the process of growth because they have a built-in program to take their own lives. Just as cells carry within them the seeds of their propagation, they also harbor the means of their end, a little program to dismantle their lives, to commit suicide (2001, p. 100). An example of this seemingly odd feature can be found in the frog. As it begins to transform from a water-dwelling tadpole to a land-dwelling frog, its tail begins to disappear. Where did it go? The frog’s tail cells stopped receiving a message from the body telling them to “stay alive!” At that point, the lysosomes released their digestive enzymes, destroying the cells, and eventually causing the tail to disappear. But there is another point here that should not be overlooked. The cell’s organelles frequently cooperate for the cell’s ultimate protection. As Ackerman later mentioned: “To protect against accidental cell death, pieces of a cell’s apoptotic machinery are sequestered in different places—in the membrane of the cell and in its mitochondria” (2001, p.102). This “sequestering” is essential for the cell’s well-being. Yet it also works to the cell’s ultimate planned destruction. If, in the beginning of life as evolutionists know it, separate organisms came together to form a cell, how could they learn to cooperate? And if they did, why would they work together to form a system that allows cellular suicide? More than thirty years of experimentation on the origin of life in the fields of chemical and molecular evolution have led to a better perception of the immensity of the problem of the origin of life on Earth rather that to its solution. At present all discussions on principal theories and experiments in the field either end in stalemate or in a confession of ignorance (1988, p. 82). These confessions are characteristic of the troubles that evolutionary theory has encountered in explaining the origin and decisive design of the cell. God’s omnipotence can be seen throughout His creation—a creation that continually defies any and all evolutionary explanations. Cairns-Smith, A.G. (1985), Seven Clues to the Origin of Life (Cambridge: Cambridge University Press). Harold, Franklin M. (2001), The Way of the Cell (Oxford: Oxford University Press). Heinze, Thomas F. (2002), How Life Began (Ontario, CA: Chick). Hey, Jody (2001), Genes, Categories, and Species (Oxford: Oxford University Press). Lester, Lane P. and James C. Hefley (1998), Human Cloning (Grand Rapids, MI: Revell). 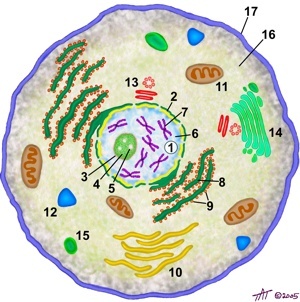 “Lysosomes” (2001), San Diego City Schools, [On-line], URL: http://projects.edtech.sandi.net/miramesa/Organelles/lyso.html. Margulis, Lynn and Dorion Sagan (1986), Microcosmos (Berkely and Los Angeles, CA: University of California). “Mitochondria” (2003), Cells Alive, [On-line], URL: http://www.cellsalive.com/cells/mitochon.htm. Muncaster, Ralph O. (2003), Dismantling Evolution (Eugene, OR: Harvest House). Thaxton, Charles B., Walter L. Bradley, and Roger L. Olsen (1984), The Mystery of Life's Origin (New York: Philosophical Library). Wilson, Edward O., et. al. (1973), Life on Earth (Stamford, CT: Sinauer).